Just because literally everything about Suicide Squad was terrible, that doesn't mean nothing good came of it. [Uhhh... --ed.] Yes, I know the two halves of that sentence are at war with each other, but maybe just pretend that one of them was put together by a trailer house after a surprisingly positive reaction to their early teaser for this review. Last year, one of my local comicshops had a fairly mediocre Black Friday sale: buy two of anything, get the third anything free. That sounds like a good deal, but only if you can find three things that are the same price - if you buy a $200 statue and a $50 hardcover, getting a $4 comic for free isn't exactly a reward, is it? Luckily, I found three things that were fairly close: Supergirl, a game I'd wanted for a while, and this MAFEX Harley Quinn, marked down from $54 to $25. Well hey, Harley was one of the okay things about Suicide Squad, so let's give the toy a try! 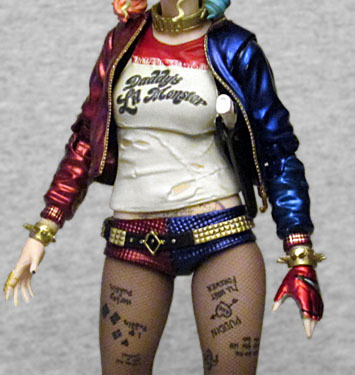 Unlike Mattel's Harley, this one is wearing her vinyl jacket. (To be fair, Mattel did make a "jacket" Harley, but it was only a Toys Я Us exclusive, and showed up about as often as Walmart's El Diablo did.) Compared to the US Harleys, the sculpt on this one is outstanding! The wrinkles are subtle and realistic, and her spangly shorts have an actual texture, rather than just relying on paint. Her belt, bracelets, and her "PUDDIN" necklace are all separate pieces, with super crisp molding. Her legs have the texture of fishnet stockings, and those stupid, stupid shoes she wears are done with an equal level of care and attention. Harley's likeness is so much better on this toy than on Mattel's that it's not even funny. It's like the difference between McFarlane Toys and Funko. This is unquestionably Margot Robbie, with a slight squint and a smirk. If having a calm, calculating look isn't what you want, the set also includes a second head, with the mouth open in a wide, gleeful laugh. Now that's our Harley! The paint is just as masterful as the sculpt. Her skin is pale, providing a good base to contrast her makeup - the bright red lipstick and the colorful smears under her eyes. The fingernails on her right hand alternate red and blue, and all the tattoos on her face, legs, mons, and lower back are tampographed cleanly. The legs are a darker shade than the rest of the body, to suggest the material of the fishnets, but the white paint on the upper portions of her shoes is a little too thin to adequately cover. Her shirt has the "Daddy's L'il Monster" logo and a faded edge between the red and gold sections, but what's really impressive is the back of her jacket: the ornate "Property of Joker" design is presented here perfectly, and the stripes on her arms get their own golden paint apps. If absolutely blowing Mattel out of the water in terms of sculpt and paint wasn't already enough, we now get to the articulation. Harl moves at the head, shoulders, biceps, elbows, wrists, chest, waist, hips, thighs, knees, and ankles. Most of those are balljoints, or at least partially balljoints - the shoulders, for instance, go into the torso with a balljoint, but then have a hinge and swivel where they go into the arm. The elbows and knees have double-hinges specifically designed to allow the joints to bend all the way while still looking good. The wrists are Revoltech style, with a swivel both above and below the hinge. Plus, her ponytails have swivels, so they can flop around realistically as she moves! The soles of her shoes are slightly rounded, which will make it a little tough to get her to stand safely, but the set includes a clear stand with a C-clamp to support her in wilder poses. While we're on the subject, we might as well talk about another area where Mattel's toy was junk: the accessories. Like that toy, this one comes with her baseball bat; unlike that toy, this one actually gets all the paint apps and deco that it should - not just the "GOOD NIGHT" lettering, but the diamond harlequin pattern above the tape and the random writing all over the rest (just squiggly black lines, but that's enough at this scale). We also get the mallet that only the TRU exclusive came with, featuring rough, dirty faces with X-eyed smileys painted on them. Her revolver (a customized Chiappa Rhino 60DS)gets ornate golden apps, including the tiny "love" and "hate" on the cylinder. The revolver you can see in her holster is really just the handle, not a full thing, and it can be snapped out of there so the toy doesn't end up with an extra gun if that's how you want to display her.Finally, the figure has five extra hands: she has two "relaxed" ones in the package, then you can trade those for ones with the trigger fingers out, ones to hold the melee weapons, or a left hand curled to support the bat (as seen on the back of the box). MAFEX is Medicom Toy's entry into the "these are nice, but dang are they expensive" niche that Figuarts and Figma were already filling. Oh, and Revoltech. 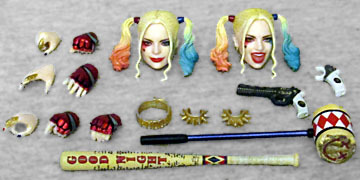 Mattel's Harley Quinn was pretty junky, and really not worth buying, but this one? She's absolutely great for the sale price I got, but she wouldn't be a total ripoff at the SRP, either.